Aviation Updates Philippines - Regional airline, AirSWIFT Airlines, on Sunday, filed reservation for its El Nido-Davao service expected to be launched late-Summer 2018. NEST OF THE BLUE BIRDS. AirSWIFT photographer Kit Stephen Agad luckily captures the busy aircraft movement in El Nido. Flights between the two tourist destinations are expected to commence on May 22, 2018 amidst the summer peak season. This will offer convenience to passengers flying between Davao and El Nido for they will be able to avoid high-passenger volume airports like Manila and Cebu. Aviation news website AirlineRoute.net revealed the airline's scheduling for this new route. AirSWIFT will be flying three times a week every Tuesdays, Thursdays, and Saturdays on an ATR 42-600 aircraft. Flight T6-712 from El Nido to Davao departs at 11:25 AM and arrives at 1:40 PM. There will be a 30-minute turnaround time before the return flight, T6-713 departs at 2:10 PM and arrives at 4:25 PM. Plans to service both destinations sparked in January when AirSWIFT Transport Commercial Head Rolando Nuñez announced the airline's intentions. Reservations were expected to commence in March. "We have talked to some wholesalers and agents who are interested on these flights. So we can say that the market is really bullish," said Nuñez adding they have already entered into partnerships with two Davao-based agents -- Summit World and John Gold -- for the upcoming establishment of the flights. "We are hoping to hit the 60 percent (%) of the 48-seating capacities of the aircraft by the time we launch and then 70% by the end of the year," Nuñez said in an interview with SunStar Philippines in January. Recently, AirSWIFT launched direct flights between El Nido and Puerto Princesa in Palawan on Wednesday. 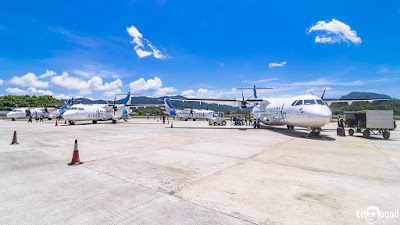 This short 40-minute hop is being serviced by the airline's newest ATR 72-600 fleet capable of flying more than 70 passengers in an all-economy configuration.